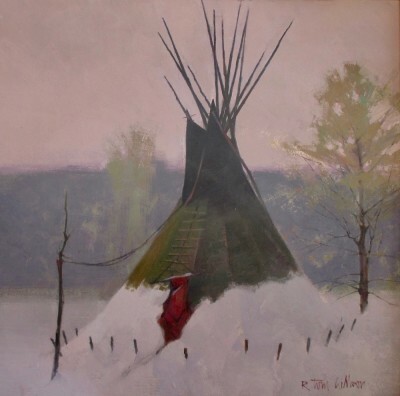 Altamira Fine Art Scottsdale is pleased to present new work from R. Tom Gilleon in a special exhibition, Ten Little Tipi’s. Ten 16 x 16 inch tipi paintings will be uniquely displayed January 29-February 3. Meet the Artist at the reception on Thursday, February 1 from 6:30-9pm during the Scottsdale ArtWalk. A master of color and composition, Gilleon manipulates formal elements to depict time-honored Western themes in new and inventive ways. His evocative perceptions of reality feature bold, luminous color and economy of detail. His trademark teepee paintings suggest a mythical glow, as if illuminated by the moon or glowing embers within. R. Tom Gilleon is a nationally known artist whose work is in prominent private and public collections across the country. Gilleon was born in 1942 and raised by his grandparents in the tiny outpost of Starke, Florida, near the storied banks of the Suwannee River. Gilleon’s grandfather had immigrated to the United States from Scotland. His grandmother, a full-blooded Cherokee, was descended from a band of tribal members who refused to partake in the infamous Trail of Tears. Gilleon studied at the University of Florida and at Ringling College of Art and Design, and subsequently took a job as an illustrator for NASA’s Apollo space program. He has spent many years working with Disney and other design groups. 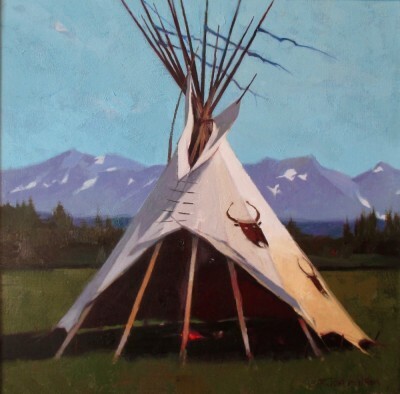 Gilleon has since been known primarily for his oils on canvas, in particular his signature tipi paintings. Gilleon has garnered many top honors for his artwork. He is the only living artist to have a solo exhibition at the C.M Russell Museum in Great Falls, MT. He has works in the permanent collection of the Booth Western Art Museum in Cartersville, Georgia and the Buffalo Bill Center of the West, in Cody, WY. Gilleon was the featured artist for the 2009 Jackson Hole Fall Arts Festival an his work has been featured on the cover of Southwest Art, Art of the West, Western Art Collector and Big Sky Journal magazines.